The Mac-10 in Grand Theft Auto: Vice City. 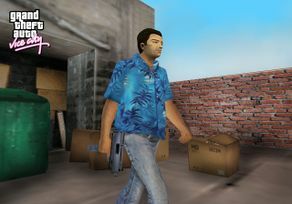 Tommy Vercetti wielding a MAC-10 in a pre-release screenshot of Grand Theft Auto: Vice City. Cheap. Extremely dangerous rapid-fire. Avaliable at a supermarket near you. The MAC-10 is a sub-machine gun available in Grand Theft Auto: Vice City, Grand Theft Auto: Liberty City Stories and a silenced version in Grand Theft Auto: Vice City Stories. 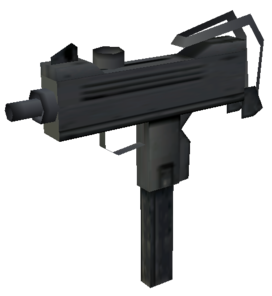 It is named as the Ingram Mac 10 in the original PS2 version of Vice City, Mac in subsequent versions, and Silenced MG in Vice City Stories. The MAC-10, abbreviation of Military Armament Corporation Model 10, is a recoil operated sub-machine gun (technically, a "machine pistol") developed in the United States from the 1960s to 1980s. The gun was originally designed for use by police forces, and even saw limited service in the Vietnam War, however it was soon proven that such a small gun cannot accurately fire beyond 20 meters at such a high rate of fire. Its manufacture continued until 1986 when post-dated fully automatic firearms were banned for civilian ownership, and no government agencies showed interest. The MAC-10 achieved success through Hollywood rather than real life, because few of the guns ever made it into the hands of criminals, and even then were marginally effective. In GTA Vice City and Liberty City Stories, the MAC-10 has an unbelievably fast rate of fire and can shoot up to 30 rounds in five seconds. In fact, it is faster than the Micro Uzi, but qualifies as the weakest firearm in the game, dealing only 15 points of damage. In GTA Vice City Stories, the silencer has slowed down the MAC-10's rate of fire and thus it's not able to fire as many rounds at a limited amount of time as its predecessor. The silencer on this incarnation of the MAC-10 may be a reference to the 1994 film Pulp Fiction. Typically, no one uses the Mac-10 in GTA Vice City, except for the Ammu-Nation owner in Ocean Beach if threatened by the player. In Vice City Stories, the Silenced Mac-10 is used by many players throughout the game. Some of your gang members use Macs to defend themselves. Tommy Vercetti wielding and firing a MAC-10 in GTA Vice City. Toni Cipriani firing a MAC-10. GTA Vice City (PC/console version). The MAC-10 in real life. Viceport - Spawns across Chartered Libertine Lines and the Boatyard next to a Rumpo parked there. Harwood, Portland - Spawns near the junkyard and the car crusher, with fences around. Bedford Point, Staunton Island - In the southeast end of the Bedford Point car park. Little Havana - The Mac-10 spawns in an alleyway near a Sanchez and across a graffiti east of Café Robina. Starfish Island - Behind Diaz's mansion. Also, can be taken from wasted Vic's gang members. On the iOS and Android versions of GTA Vice City, the MAC-10 uses a blue-and-pink version of the Micro Uzi's GTA III weapon icon. This page was last modified on 28 November 2014, at 23:13.